Parking: Available immediately south of the building in Lot D22 with extra parking a block north (Lot D9) after 5:00pm. Title: "State Farm Center Renovation Project"
This presentation will provide a look into the renovation of the State Farm Center (Assembly Hall) located at the University of Illinois in Champaign/Urbana. The renovation of the facility is under strict and tight schedule deadlines, while the design is a challenge to balance the iconic aesthetics of the arena while upgrading it to a modern venue. Both the schedule and design of the facility make this project challenging and exciting. The talk will look into the design elements fo the renovated facility and how exisitng elements are being incorporated into the design. It will also look into the new elements being added to the arena along with some of the behind the scenes upgrades to the facility. During the presentation, the phasing of the construction work will also be brough up and how it impacts the project. RSVP directly to the Section and pay using cash or check at the event during Registration and Social Hour. 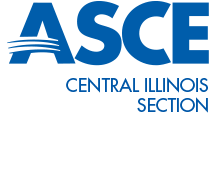 RSVP and pay by credit card using the Central Illinois Section PayPal account below. Include the name of your spouse or significant other for registration purposes but each individual will need to be registered separately. Sponsorship includes a full table of dinner tickets to the banquet. Listing in the banquet program (including corporate logo, if applicable). Recognition on the presentation screens before and after dinner and on any signage. Sponsorship includes 4 dinner tickets to the banquet. Door prizes may be specific items or monetary contributions for the purchase of prizes. Sponsors will be acknowledged during the door prize raffle at the end of the banquet.